When a fault occurs on any part of electric power system, it must be cleared quickly in order to avoid damage and/or interference with the rest of the system. It is a usual practice to divide the Types of Protection scheme into two classes viz. primary protection and back-up protection. 1. Primary Protection: It is the protection scheme which is designed to protect the compo­nent parts of the power system. Thus referring to Fig. 21.29, each line has an overcurrent relay that protects the line. If a fault occurs on any line, it will be cleared by its relay and circuit breaker. This forms the primary or main protection and serves as the first line of defence. The service record of primary relaying is very high with well over ninety percent of all operations being correct. However, sometimes faults are not cleared by primary relay system because of trouble within the relay, wiring system or breaker. Under such condi­tions, back-up protection does the required job. 2. Back-up protection: It is the second line of defense in case of failure of the primary protection. It is designed to operate with sufficient time delay so that primary relaying will be given enough time to function if it is able to. Thus referring to Fig. 21.29, relay A provides back-up protection for each of the four lines. 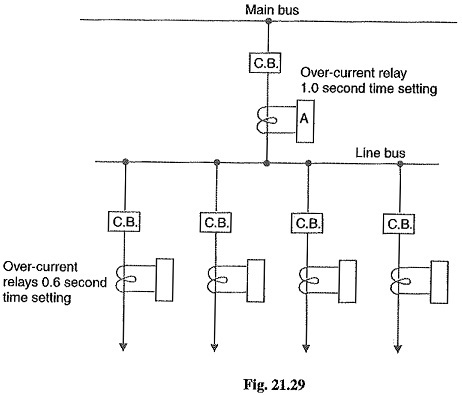 If a line fault is not cleared by its relay and breaker, the relay A on the group breaker will operate after a definite time delay and clear the entire group of lines. It is evident that when back-up relaying functions, a larger part is disconnected than when primary relaying functions correctly. Therefore, greater emphasis should be placed on the better maintenance of primary relaying.